For medical water treatment, see Water cure (therapy). Dalecarlia Water Treatment Plant, Washington, D.C.
Water treatment is any process that improves the quality of water to make it more acceptable for a specific end-use. The end use may be drinking, industrial water supply, irrigation, river flow maintenance, water recreation or many other uses, including being safely returned to the environment. Water treatment removes contaminants and undesirable components, or reduces their concentration so that the water becomes fit for its desired end-use. This treatment is crucial to human health and allows humans to benefit from both drinking and irrigation use. Early water treatment methods still used included sand filtration and chlorination. The first documented use of sand filters to purify the water supply dates to 1804, when the owner of a bleachery in Paisley, Scotland, John Gibb, installed an experimental filter, selling his unwanted surplus to the public. This method was refined in the following two decades, and it culminated in the first treated public water supply in the world, installed by the Chelsea Waterworks Company in London in 1829. Treatment for drinking water production involves the removal of contaminants from raw water to produce water that is pure enough for human consumption without any short term or long term risk of any adverse health effect.In general terms, the greatest microbial risks are associated with ingestion of water that is contaminated with human or animal (including bird) faeces. Faeces can be a source of pathogenic bacteria, viruses, protozoa and helminths. [Guidelines for Drinking-water quality]. Substances that are removed during the process of drinking water treatment,</ref>Disinfection is of unquestionable importance in the supply of safe drinking-water. The destruction of microbial pathogens is essential and very commonly involves the use of reactive chemical agents such suspended solids, bacteria, algae, viruses, fungi, and minerals such as iron and manganese. These substances continue to cause great harm to several lower developed countries who do not have access to water purification. The processes involved in removing the contaminants include physical processes such as settling and filtration, chemical processes such as disinfection and coagulation and biological processes such as slow sand filtration. Measures taken to ensure water quality not only relate to the treatment of the water, but to its conveyance and distribution after treatment. It is therefore common practice to keep residual disinfectants in the treated water to kill bacteriological contamination during distribution. World Health Organization (WHO) guidelines are a general set of standards intended to apply where better local standards are not implemented. More rigorous standards apply across Europe, the USA and in most other developed countries. followed throughout the world for drinking water quality requirements. Water supplied to domestic properties, for tap water or other uses, may be further treated before use, often using an in-line treatment process. Such treatments can include water softening or ion exchange. Many proprietary systems also claim to remove residual disinfectants and heavy metal ions. Filtration to remove particles from water either by passage through a sand bed that can be washed and reused or by passage through a purpose designed filter that may be washable. Disinfection for killing bacteria viruses and other pathogens. Technologies for potable water and other uses are well developed, and generalized designs are available from which treatment processes can be selected for pilot testing on the specific source water. In addition, a number of private companies provide patented technological solutions for the treatment of specific contaminants. Automation of water treatment is common in the developed world. Source water quality through the seasons, scale, and environmental impact can dictate capital costs and operating costs. End use of the treated water dictates the necessary quality monitoring technologies, and locally available skills typically dictate the level of automation adopted. Two of the main processes of industrial water treatment are boiler water treatment and cooling water treatment. A large amount of proper water treatment can lead to the reaction of solids and bacteria within pipe work and boiler housing. Steam boilers can suffer from scale or corrosion when left untreated. Scale deposits can lead to weak and dangerous machinery, while additional fuel is required to heat the same level of water because of the rise in thermal resistance. Poor quality dirty water can become a breeding ground for bacteria such as Legionella causing a risk to public health. Corrosion in low pressure boilers can be caused by dissolved oxygen, acidity and excessive alkalinity. Water treatment therefore should remove the dissolved oxygen and maintain the boiler water with the appropriate pH and alkalinity levels. Without effective water treatment, a cooling water system can suffer from scale formation, corrosion and fouling and may become a breeding ground for harmful bacteria. This reduces efficiency, shortens plant life and makes operations unreliable and unsafe. Saline water can be treated to yield fresh water. Two main processes are used, reverse osmosis or distillation. Both methods require more energy than water treatment of local surface waters, and are usually only used in coastal areas or where water such as groundwater has high salinity. Living away from drinking water supplies often requires some form of portable water treatment process. These can vary in complexity from the simple addition of a disinfectant tablet in a hiker's water bottle through to complex multi-stage processes carried by boat or plane to disaster areas. This methods can be extremely convenient when disasters take place, and should be limited while preserving the remaining freshwater on earth. Some industries such as the production of silicon wafers, space technology and many high quality metallurgical process require ultrapure water. The production of such water typically involves many stages, and can include reverse osmosis, ion exchange and several distillation stages using solid tin apparatus. This method is extremely useful by making water production extremely pure by the EPA water quality standards. Appropriate technology options in water treatment include both community-scale and household-scale point-of-use (POU) or self-supply designs. Such designs may employ solar water disinfection methods, using solar irradiation to inactivate harmful waterborne microorganisms directly, mainly by the UV-A component of the solar spectrum, or indirectly through the presence of an oxide photocatalyst, typically supported TiO2 in its anatase or rutile phases. 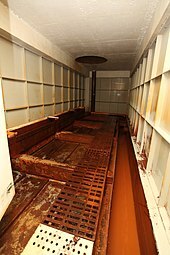 Despite progress in SODIS technology, military surplus water treatment units like the ERDLator are still frequently used in developing countries. Newer military style Reverse Osmosis Water Purification Units (ROWPU) are portable, self-contained water treatment plants are becoming more available for public use. For waterborne disease reduction to last, water treatment programs that research and development groups start in developing countries must be sustainable by the citizens of those countries. This can ensure the efficiency of such programs after the departure of the research team, as monitoring is difficult because of the remoteness of many locations. Water treatment plants can be significant consumers of energy. In California, more than 4% of the state's electricity consumption goes towards transporting moderate quality water over long distances, treating that water to a high standard. In areas with high quality water sources which flow by gravity to the point of consumption,, costs will be much lower. Much of the energy requirements are in pumping. Processes that avoid the need for pumping tend to have overall low energy demands. Those water treatment technologies that have very low energy requirements including trickling filters, slow sand filters, gravity aqueducts. The Safe Drinking Water Act requires the U.S. Environmental Protection Agency (EPA) to set standards for drinking water quality in public water systems (entities that provide water for human consumption to at least 25 people for at least 60 days a year). Enforcement of the standards is mostly carried out by state health agencies. States may set standards that are more stringent than the federal standards. EPA has set standards for over 90 contaminants organized into six groups: microorganisms, disinfectants, disinfection byproducts, inorganic chemicals, organic chemicals and radionuclides. EPA also identifies and lists unregulated contaminants which may require regulation. The Contaminant Candidate List is published every five years, and EPA is required to decide whether to regulate at least five or more listed contaminants. Local drinking water utilities may apply for low interest loans, to make facility improvements, through the Drinking Water State Revolving Fund. ^ Huisman, L.; Wood, W.E. (1974). "Chapter 2. Filtration of Water Supplies". Slow Sand Filtration (PDF). Geneva: World Health Organization. ISBN 92-4-154037-0. ^ Buchan, James (2003). Crowded with genius: the Scottish enlightenment: Edinburgh's moment of the mind. New York: HarperCollins. ISBN 9780060558888. ^ Frerichs, Ralph R. "History of the Chelsea Waterworks". John Snow. Fielding School of Public Health, University of California, Los Angeles. Retrieved 2016-07-09. ^ Christman, Keith (September 1998). "The history of chlorine". WaterWorld. Tulsa, OK: PennWell. 14 (8): 66–67. ^ Cicek, V. (2013). "Corrosion and corrosion prevention in boilers". Cathodic protection: industrial solutions for protecting against corrosion. Hoboken, New Jersey: John Wiley & Sons. ISBN 9781118737880. ^ Warsinger, David M.; Mistry, Karan H.; Nayar, Kishor G.; Chung, Hyung Won; Lienhard V, John H. (2015). "Entropy Generation of Desalination Powered by Variable Temperature Waste Heat". Entropy. 17 (11): 7530–7566. doi:10.3390/e17117530. ^ Lienhard, John H.; Thiel, Gregory P.; Warsinger, David M.; Banchik, Leonardo D. (2016-12-08). "Low Carbon Desalination: Status and Research, Development, and Demonstration Needs, Report of a workshop conducted at the Massachusetts Institute of Technology in association with the Global Clean Water Desalination Alliance". Massachusetts Institute of Technology. ^ "Household Water Treatment Guide". Centre for Affordable Water and Sanitation Technology, Canada. March 2008. ^ "Sand as a low-cost support for titanium dioxide photocatalysts". Materials Views. Wiley VCH. ^ Lindsten, Don C. (September 1984). "Technology transfer: Water purification, U.S. Army to the civilian community". The Journal of Technology Transfer. 9 (1): 57–59. doi:10.1007/BF02189057. ^ "Energy Costs of Water in California". large.stanford.edu. Retrieved 2017-05-07. ^ United States. Safe Drinking Water Act. Pub.L. 93–523; 88 Stat. 1660; 42 U.S.C. § 300f et seq. 1974-12-16. ^ "Primacy Enforcement Responsibility for Public Water Systems". Drinking Water Requirements for States and Public Water Systems. Washington, D.C.: United States Environmental Protection Agency (EPA). 2015-11-09. ^ Understanding the Safe Drinking Water Act (Report). EPA. June 2004. EPA 816-F-04-030. ^ "Table of Regulated Drinking Water Contaminants". Your Drinking Water. EPA. 2017-03-21. ^ "Basic Information on the CCL and Regulatory Determination". Contaminant Candidate List. EPA. 2017-04-26. ^ "Drinking Water State Revolving Fund". EPA. 2017-05-02. Eaton, Andrew D.; Franson, Mary Ann H. (2005). Standard methods for the examination of water and wastewater (21 ed.). American Public Health Association. ISBN 978-0-87553-047-5. Wikimedia Commons has media related to Water treatment.